We are in the middle of preparing to move across the country but I have found a little time for knitting/crafting and reading. We kept this past Sunday an absolute day of rest and boy did it make a difference! I only got a few more rows done on the lace baby blanket, good thing my cousin's baby isn't due until December! To try and redeem these curtains, I have cut out a moon and a bunch of stars of different sizes to sew onto them. Hopefully this will make them lovely night sky curtains instead of the current depressing WWII air raid curtains. Sewing the stars is my craft project for our 20 hour drive up North. I am hopeful of getting at least a few stars sewn on between doling out snacks and managing coloring books. I am still reading through The Little Oratory and I still love it. The little sketches in it make it so homey and cozy to read. But, this weekend, I took a little break to read Willa Cather's novella, My Mortal Enemy. I was worried about this one from the descriptions of it that I had read. But, what a pleasant surprise, My Mortal Enemy is good, and spiritually so as well. The story is about coming back to the Faith at the end of life - a little dark, but well worth the read. There are some breathtaking descriptions in it as well. Love Willa Cather! Black is a nightmare to sew! But the stars will look so good on it! Maybe do a planet or a moon too? Or is that just a step too close to insanity? I love the planet idea, thank you! Spray paint, genius! Or maybe gluing on some thick brocade :)? Praying for your move! And looking forward to creating a book with you when your settled! Thank you so much for your prayers! I'm looking forward too. Wait a sec... your *friend*'s baby, right? Did I miss something? Gorgeous pattern! Looking for something different to read- this book sounds really good. Thank you so much and I hope that you enjoy the book! Best of luck on your move. 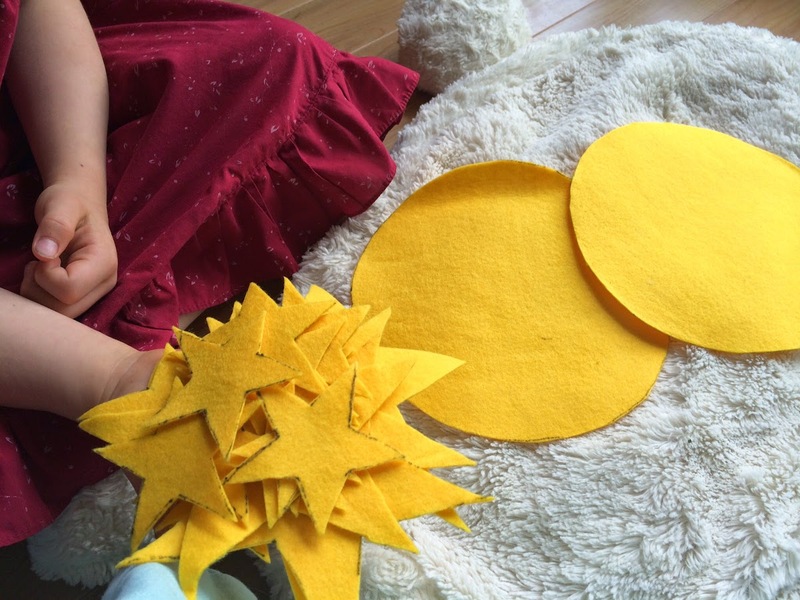 I'm glad you are finding some time to craft a bit - it is probably a great stress reliever! IT is such a stress reliever. I love how crafting helps create order in the middle of chaos. Pretty white stitches:) Loved reading your review, adding yet another book to my list. Wishing you a stress-free move (as much as that's possible). Have a lovely day! Good Luck with the move! 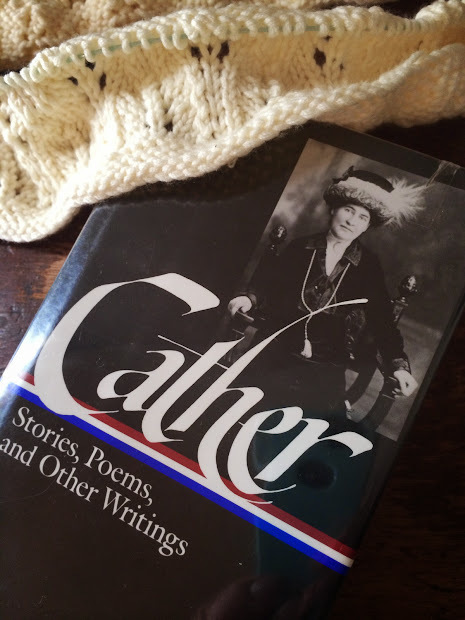 very pretty knitting and I love Willa Cather too! Good luck on your move. Try to play lots of I-spy games on that long trip. I have blackout drapes in my own bedroom as I like it dark when I sleep. Hubby and I found out the hard way that the rising sun shines directly through one of my windows. My curtains are toile with a white blackout lining. I bought a bunch more of this lining in JoAnn's so that I could make some more drapes. Thanks so much for the tips! Your drapes sound so great! Inspiring that you have time to read and knit while packing for a huge move! Is Yarn Along a link up? I thought it was, but I don't see a link up place. I'm actually knitting right now and wanted to post it. Hi, Jenny! Yes, it's a weekly linkup at small things (gsheller.com). I put the link at the bottom but I'll have to be more clear next time! Her blog is so beautiful, you will love it. You can post your link any time this week. I hope you are having a good move too! I love your stars, what a great idea to brighten up the curtains. I bet they'll look lovely.